Our mission is to deliver optimal patient care, so people can continue to find autonomy, meaning, and connection in life. 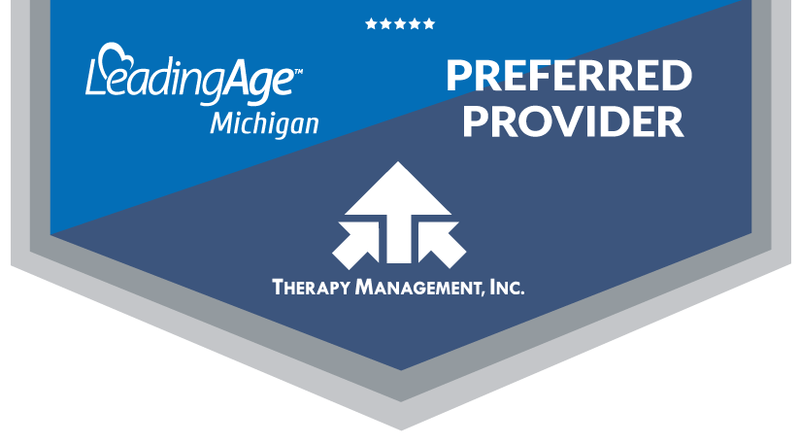 Therapy Management, Inc. is a Michigan-based contract rehabilitation program that has been providing services in nursing homes and senior communities since 2007. Our experience ranges from small SNF programs to contracts in large nursing homes with Medicare Part A rehab census of 50+ patients. In our largest program, we manage 100+ sub-acute Medicare patients per day. Therapy Management, Inc. is large enough to be a stable partner and nimble enough to provide programs unique to our partners. Customers tell us we provide “care beyond compare” to both patients/residents and to the teams at each facility. Each program is tailored to their needs, goals, and environment (vs a “one size fits all” approach). Personalized service & steadfast relationships – As an independent, boutique provider, we tailor our services to meet the needs of each client and resident. Flexibility & problem solving – Our industry knowledge, therapy expertise, creativity, and interpersonal skills allow us to be flexible, adaptable, & solve problems on the spot. Teamwork & ownership – Through team-building, extensive training, and leadership coaching, we empower each of our team members to excel as a clinician, contribute her/his strengths to the team, lead by example, and take ownership in our outcomes. Our leadership team has over 75 years of hand- on experience working with SNF/sub acute facilities. Our in depth knowledge of both PPS Medicare Part A and MDS 3.0 sets us apart from others. With our long term care programming and excellent customer service, we offer facilities individualized programs tailored to their communities’ brand, goals, and exact needs. Why do clients choose us and stay with us over the long haul? Attentiveness – Clients appreciate the level of attention they receive from our leadership team, area managers, and therapy program manager. Creativity – “No” is not in our vocabulary. We work with clients to find creative solutions to meet their needs. Expertise – Change is a constant in our industry. With decades of experience, we understand how to manage robust therapy programs in an ever-changing regulatory environment, capture appropriate reimbursement, and train, coach, and motivate our team members to provide the best clinical care. Data & Analytics – Through the use of innovative software and systems, we help our clients to improve performance, outcomes, care, and patient satisfaction. Person-Centered Care – When we put the patient/person first, all else falls in line. OT, PT and Speech services delivered 7 days/week with large PRN pool for caseload fluctuations. Superb Therapy Program Directors – Our program managers are experienced, continually supported and trained by leadership, and empowered to make good decisions as they oversee clients’ programs and day to day activities. Training – We provide continuing education to our team, as well as specialized training to our clients’ teams, as well as access to an MDS nurse. What is the biggest contributing factor to our success? Our clients will tell you that there is magic is in the way we form relationships with them. Unlike national companies who work with hundreds of facilities, we do not provide cookie cutter programs or prioritize productivity expectations over patient care and customer service. Our clients’ experience defines us. Our clients say that their experience as our customer feels more like a boutique hotel than a Holiday Inn. They get dedicated attention, and they get exactly what they need. How do we ensure great relationships with our clients? We employ charming, empathetic therapists whose path in life is to compassionately serve others. Our therapists and therapy assistants have both technical knowledge and highly developed clinical skills. They know how to motivate patients in the therapy clinic to meet their goals. They also know how to work together cooperatively with your team and adapt to the individualized requirements of your facility.